All too often, marketers overlook minor but nevertheless important segments of their target audience without even realizing it. For instance, if you sell informational products only in text form, how could someone who is blind access your information? In a similar sense, how can deaf and hard-of-hearing individuals access your video or podcast if you never publish audio transcripts or include subtitles? According to the Centers for Disease Control, there are over 3.4 million Americans who are legally blind or significantly visually impaired (note: these figures only account for adults 40 years and older). Meanwhile the U.S. National Library of Medicine reports that over one million American adults are functionally deaf and an additional 10 million adults are classified as hard-of-hearing. If you primarily advertise your products/services with the help of podcasts and videos, then make sure each one is accompanied by a full text transcript and/or subtitles. On the flip side, if you only have written content on your brand’s blog, don’t forget to include text alternatives for images because screen readers are not yet advanced enough to describe visual imagery to their visually impaired users. Here’s a good example of text alternatives for images: “purple bowl containing three scoops of chocolate ice cream with whipped cream and a cherry on top.” It’s important to be descriptive with your text alternative (not just “ice cream sundae”) and include relevant keywords without going overboard into keyword stuffing territory. Include verbal descriptions of actions going on in a video, inserted during pauses in which there is no dialogue. Include alternative texts in every social media post. Quirky captions that don’t describe the photo at all can be frustrating for visually impaired followers. For more strategies to increase the accessibility of your social media and blog content for audience members with disabilities, be sure to follow the Golden Rules of Social Media Accessibility. A final way you can optimize your social content for people with disabilities is by representing them in your advertisements. 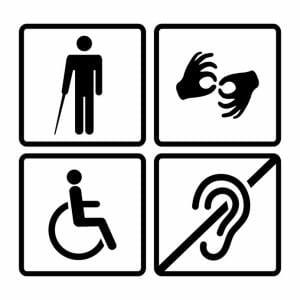 For example, you may include images of people in wheelchairs or wearing hearing aids in your advertisements while explicitly mentioning how individuals with disabilities can benefit from your products/services on your website. Every little action you take to make your brand more accessible to a wider variety of audience members truly matters. Unless you personally know someone who is hearing or visually impaired, it’s admittedly difficult to remember how much representation and accessibility matters.